Samar tourism council urges tourists to experience the many water forms in Samar where tourists can refresh themselves through the hot summer months. In a meeting with agency partners and the private sector to push eco-tourism in Samar recently, the council headed by Gov Sharee Ann Tan revealed ready tourist destinations in the 3rd largest island. Despite the many tourist destinations in Samar with its undisturbed and unexplored mountains and eco-tourism sites, Samar will initially offer Sohoton Cave in Basey and Ulot Watershed torpedo boat ride. In Basey, tourists can explore Sohoton caves, inside the Sohoton Natural Park. The 840-hectare park features limestone walls, a natural rock bridge, underground river, verdant forests and caves with majestic interiors that tourists rave about. According to TripAdvisor blog, Sohoton cave ranks number 6 in tourist destinations in the country. It is also considered among the top 102 attractions in Samar Island. On the other hand, the Ulot Torpedo Boat Ride in Barangay Tenani, Paranas, Samar has also been drawing crowds of adventurers especially the younger generation for its extreme adventure. Boat riders are ushered into torpedo-like boats. Torpedo stands for Tenani boat Operators for River Protection and Environmental Development. 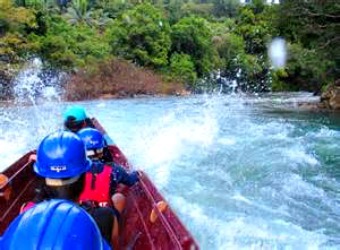 Ulot River is a 31-kilometer river where the torpedo river cruise weaves in and out of large stones manuevered by the best boatmen. These boatmen were said to be lumberjacks that switched careers from being timber poachers to protectors of the river and the environment. The ride also treats one to the verdant forest and birdlife.